Does this "how to" thread refers to evo x and RA as well? I followed what a radiator shop here advised me. 1. With the car cold, undo drain plug a little bit, remove a little bit of coolant, tighten plug back up. Add half bottle of radiator cleaner, run engine 20-30mins (follow bottle directions) + heater max temp + running full speed fan. 2. Let the car cool down, once cold, undo drain plug, drain all water out of the radiator, re-tighten drain plug. 3. Then add the other half of radiator cleaner, re-add water to the radiator till its full (I used tap water), run engine again for 20-30mins (follow bottle directions) + heater max temp + running full speed fan. 4. Again, let the car cool down, once cold, undo drain plug, drain all water out of the radiator, re-tighten drain plug. 5. Remove, empty and clean the radiator reservoir bottle. You'll find when draining the second time, that the clean water you added will mix with the old coolant still left in the block and heater core. I didn't want to continually repeat the above steps of draining & re-adding distilled water. I highly doubt any workshop would use distilled water to be honest. 6. What I got told and did, was to remove the top radiator hose. Then I put the radiator top hose into a PVC pipe that ran down to the ground & into a bucket to collect the old coolant. Fill up the radiator with tap water. Then grab your garden hose and have the water on a slowish flow, and to control it, you will bend the garden hose. 7. Start the engine (with heater on max + fan on full speed and radiator cap off), the car will heat up, the thermostat will open, the old coolant will flow out from the top hose and into the bucket. 8. The radiator water level will drop as the cold water is being sucked from the radiator into the engine, replacing the hot/old coolant we are removing. You will need to keep topping up the radiator with fresh tap water from your garden hose. Don't let the radiator go dry. On a side note, be careful with the water coming out of the top hose, it will be hot! 9. 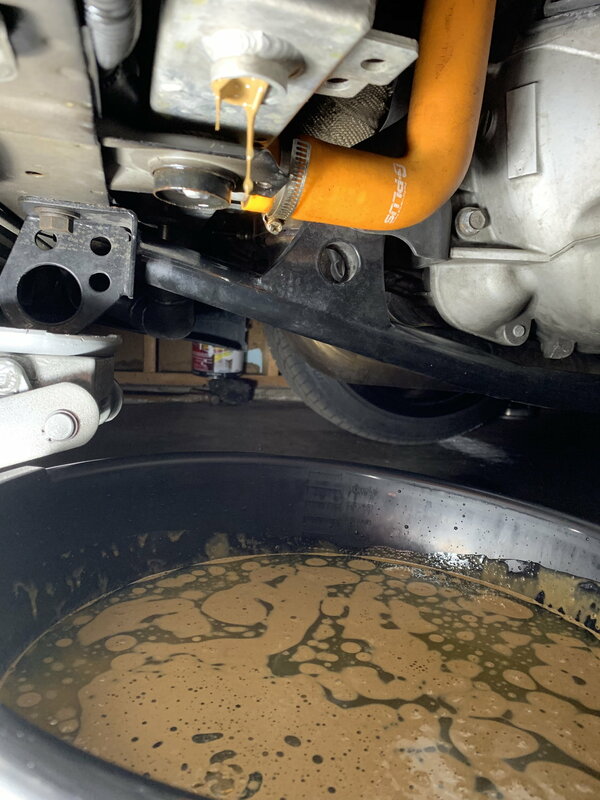 Continue this process for a while until you notice that the water coming out of the top hose is clear, its probably easier to tell by replacing the bucket your old coolant is flowing into. You will basically see clear steaming water. It took me around 15 to 20 minutes. You then know all the old coolant is completely gone. 10. Now, there will still be plain water in the block & heater core, so I'm going to do a 60-40 mix, which will probably end up being 50-50 hopefully, although its probably better just to do a 50-50 pre-mix. Basically all I did was get an empty container (I actually bought 2L distilled water bottles, so I just poured 1L out of it, and filled it up with 1L of coolant), make a 50-50 mix of coolant & distilled water, mixed it together, and then pour it into the radiator. Continue this until the radiator is full to the top. 11. Then fill your radiator reservoir bottle with new coolant - 50-50 mix, same as step 10, to the "max" level marking. 12. Leave the radiator cap off, and the reservoir bottle cap off, and let the car idle for maybe 15 minutes, you will see the coolant circulating around, this will help remove any trapped bubbles. I honestly didn't see any with mine, but I did it for the sake of it. Sure I'll probably have a tiny amount of "tap" water in the block & heater core, but it should be perfectly fine. Anyway, hope that helps, not sure why people don't flush the way I've suggested. Probably a little more dangerous (in terms of being burnt), but yeah, practical and ensure you remove all the old stuff. To be honest, this is the first time I've done anything like this, but on reflection, it was pretty easy, just take your time. I replaced my radiator, fan controller and the 3 pin fan controller plug so I'm learning things which is great. Last edited by leftywhat; May 16, 2015 at 09:54 PM. how do you know when the radiator itself is full? or do you just fill up and then worry about what it says on the reservoir? i fill reservoir to the full mark, then fill radiator till the coolant reaches the neck. Once you have reached operating temperature and the thermostat is open then you will have to burp the system and continue topping off till it starts to pulsate and overflow. After a good 30secs of no bubbles, you should be good.. Either that or just jack the car up from the front, once the thermostat opens all the air will travel to the cap, I'm about to run waterless coolant in my evo, it's a little bit more expensive but the benefits are amazing, I can also delete the overflow tank, not have to worry about a pressure cap, and corrosion. Awesome! I was planning on doing this for my EVO 4! Thanks! I might be doing this soon on my evo 8! But my hvac controls don't work and i can't turn the knob to hot. Great. This helped me a ton. old thread.. but i know it was asked but noone answered this... what if i cant turn my knob to the heater position? its stuck... yes ive seen the repair but i dont have time to order the repair kit... how do i bleed the system then? If you have another person to help it is easy. You get down by the gas and brake pedals and ask your friend to turn it to coldest, then to warmest (as far as it will go) back and forth until you know which way you want the white gears to turn. Then have them turn it all the way to hot while you "give it a push" directly on the the white plastic gears. It should turn over easily. How often should coolant be changed? Will this get out all of that gunk too? Looks like you have oil in your coolant. Blown head gasket? yeah, that’s what they’ve been saying. Still gonna do a leak down test also.l before I start tearing it apart. Compression is 90 at cold and slightly warmed up is 100.